Meetup.com can help you target your volunteer outreach and organize volunteer events. On the site, people can create or find groups and plan events based around activities they enjoy, such as volunteering. You can search Meetup to see if there are volunteer groups in your city or county. In the Washington, D.C., area, for example, there are 73 groups in a 10-mile radius that have something to do with volunteering. One such group has more than 1,500 members. This would be a great target audience to reach out to and recruit from for your own organization. Meetup.com allows you to easily reach people who already enjoy volunteering. 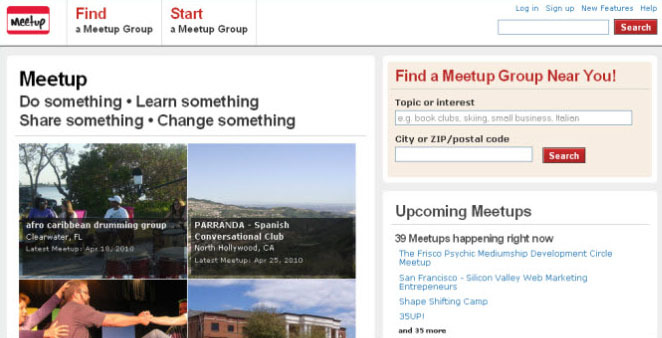 Meetup.com is a website where people can organize associations, clubs, or groups, and plan things to do offline and in-person. Group themes range from hikers, to business-starters, to dog-walkers, to just about any other professional or personal interest. Meetup groups exist in almost every community and gather on a regular basis. What does this mean for your organization? You can search Meetup to see if there are volunteer groups in your area. These groups are great targets from which to recruit. You can click on the group and contact the administrator, and ask him or her if you can come to a group meeting to present about your organization. You could also request to post information about your organization on a group’s online bulletin board. By thinking outside the box a bit, you can search for groups that hit a certain demographic you may want to recruit. For instance, if you want to reach young African-American men for mentoring, you might search for a young professionals group (or young black professionals). In this way, Meetup.com can help you target your volunteer outreach. Start your own Meetup group to publicize your work and organize events. Starting a Meetup group can help boost interest in your organization. For example, if someone visits the Meetup site and searches for volunteer opportunities in your area, they may find your group and directly contact you to express their interest. You can also organize events for your current volunteers. The point of these events is to create ways for your volunteers to come together on a regular basis, and to recruit additional volunteers. For example, one strategy used by some mentoring groups is to create a “sports buddies” event. These events are good bonding sessions for mentors and mentees, but they can also draw the attention of new potential male mentors. Recruiting male mentors is a common challenge, but if a male goes to Meetup.com and searches “sports,” “mentoring,” or “youth,” he may find the group and become interested. A person can request to join a group by providing his/her name and email address. Meetup.com offers privacy controls so that, if you set your group to “private,” viewers of the group page (who are not members) cannot see who your members are or when/where they are meeting. You can designate it so only members can access this information. This is important, for example, if you’re working with youth and would want to screen adults before they show up at an event. Report card: Meetup is less intimidating and intense than Facebook, but the organizer pays some low fees. Meetup.com offers three fee options: six months for $12 a month; three months for $15 a month; or one month for $19. (Check the website directly, as these fees change regularly.) Only the organizer has to pay; members of Meetup.com (i.e., your volunteers) pay nothing. Security is low, so do not post any confidential information here. Administrator and user skill levels are similar to Facebook, but Meetup is a bit easier to set up. Facebook has a lot of options, and Meetup is more straightforward. For users, the site requires only that a person be comfortable surfing the web. A great benefit of Meetup is the ability to target your outreach to people of certain demographics, with certain interests, etc. It’s also easy enough for a trusted volunteer to manage. The biggest drawback is that the site requires consistency and dedication. While it’s not necessary to log on everyday (as with Facebook), you should log on and respond to emails at least once a week. And of course, you’ll need to commit to attending the events you organize. Explore Meetup.com by clicking here: http://www.meetup.com.